It seems slightly unreal to be updating a historical blog post I wrote just a week ago on Jack The Ripper. Jack being the legendary serial killer in Victorian London for whom police identified over 100 suspects. However, several British newspapers have printed a story that his identity has finally been proven, again. This time if true happens to have convincing scientific evidence and just as luck would have it, I have a local connection to him. His name is Aaron Kosminski, a Jewish, Polish immigrant. The breakthrough comes from a shawl found with the body of Catherine Eddowes. It had been in unwashed for 126 years and in the private possession of a family whose ancestor was one of the police officers who found her body. The shawl had previously been DNA tested nearly 10 years ago but the results were inconclusive. However technology has moved on and a private investigator purchased the shawl and contacted world renowned Finnish DNA specialist, Dr Jari Louhelainen. A long and intensive study was made of the shawl and a cell of Catherine’s kidney was discovered, you may remember from last weeks blog that Jack removed her kidney, fried half of it for his dinner and posted the remains to the authorities with a letter. The DNA matched perfectly with that of the three times great-Granddaughter of the victim, Karen Miller. This alone was a startling breakthrough as previously though the police thought it was related to the murders, they had no firm evidence that it was. Next up was to see if they could find any DNA from Jack himself. At this point it is interesting to note that the shawl itself is an expensive item of clothing and that Catherine was so poor she had been forced to sell her shoes the day before her murder. 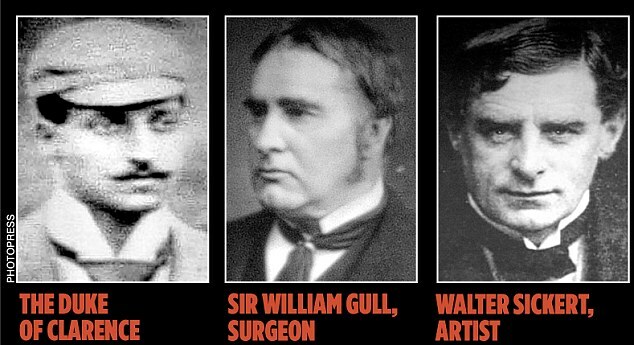 Jack The Ripper Suspects – graphic from Daily Mail newspaper. The shawl though contains a pattern related to the old saints day of Michaelmass which whilst rather forgotten about today was in Victorian times as important as Christmas or Easter. Interestingly the Church of England celebrates Michaelmass on 29th September whilst the eastern Orthodox church remembers it on the 8th of November. Anyone interested in Jack will find these dates familiar as they were the final murder dates of the canonical five victims. Was it possible that Jack was using this expensive and still beautiful piece of clothing to lure his impoverished but religiously aware victims? Next, the investigation found the cells of bodily fluid from a man. It was immediately identified as belonging to haplogroup T1a1 which is broadly speaking, dark haired Russian descended Jews. The team tracked down a descendant of Aaron Kosminski and the DNA matched perfectly though understandably that person isn’t yet ready to inform the world they are descended from Jack. Aaron Kosminski was always a police suspect and he later fell under 24 hour police surveillance before being put into an asylum for the insane. Kosminski has always been one of the three most credible suspects. He is often described as having been a hairdresser in Whitechapel, the occupation written on his admission papers to the workhouse in 1890. What is certain is he was seriously mentally ill, probably a paranoid schizophrenic who suffered auditory hallucinations and described as a misogynist. Aaron Kosminski was 23 when the murders took place, and living with his two brothers and a sister in Greenfield Street, just 200 yards from where the third victim, Elizabeth Stride, was killed. Kosminski features prominently in police records and memoirs of senior investigators and some thought him highly likely to be the Ripper and one remarked that he “had a great hatred of women … with strong homicidal tendencies”but there was never enough evidence and there were rumours that due to his ethnicity, an important witness was unwilling to formally identify him as Jack. Far from being a surgeon or a member of the Royal Family, Kosminski was rather sad and scrawny individual and just a year or so after the murders was sent to Leavesden Asylum where he lived until his death aged just 54 in March 1919. He is buried in East Ham Jewish cemetery. I walk through the old Leavesden Asylum several times a week, now I am more sure than ever that I am walking in the footsteps of Jack The Ripper. This entry was posted in history, London, Popular Culture, Ye Olde England Tours and tagged Aaron Kosminski, Catherine Eddowes, Crime, DNA, Dr Jari Louhelainen, Jack The Ripper, Life, London, Murders, News, Serial killer, Whitechapel. Bookmark the permalink. Thank you for a very interesting post. I’m not sure I’m happy about this or not. The mystery was always the draw as much as anything else. So it seems 100% sure this was the killer? But it makes sense. The person who committed these appallingly violent crimes must have been insane. So it fits all round. Except I wonder if he really wrote any of those letters to the police or if those were rather the work of pranksters…? I am torn about it too. On the one hand I am amazed and staggered that they found anything like real proof after all this time but sad that I liked the mystery element. At the very least this man had “relations” with the woman who killed so I guess that combined with the fact he was a top suspect already and along with the other evidence it seems he is highly likely to be the murderer. I guess that due to the nature of the crimes and the long period of time that has passed, it may take a long time before he is accepted as Jack. I do believe that the third letter which is written in the bad writing is authentic, especially as it came with some human organs. It also mentions that the next killing will include mutilating an ear and that is what happens. I’m sure it is still scary there at night and the fact that Jack got away with it is still an incredible feat though in a bad way. One of the great mysteries set to rest. Yes, I’m both amazed and a little bit deflated at the same time. Thank-you. It is amazing isn’t it. I remember when they tested the material in 2005 and there was so little DNA that they couldn’t get proper results that it even had the victims blood on it. They thought that because it had been handled for over 100 years it would also be contaminated. What a stroke of luck that the policemans family didn’t wash it. Also, how incredible they have found the DNA and that they found descendants it matches with. I find it quite convincing especially with the Michaelmass pattern and the fact some of the ladies were killed on that day. The problem Steven is that there is some doubt as to the origin of the ‘shawl’ itself, let alone whether it can be proven to have been at the site of the murder (s). The current owners will not release it for any testing to establish its actual date of manufacture. According to the article, Karen Miller’s (maternal descendent of Eddowes) mDNA is a 100% perfect match with Eddowes and Matilda’s (maternal descendent of Kosminski) mDNA is a perfect match with Kosminski. It is physically impossible for the mDNA of a descendent to be a perfect match with an ancestor. A generational mDNA mutation rate of 3 X 10 to the minus 5 guarantees this. A 100% perfect match CAN ONLY MEAN ONE THING, the mDNA on the shawl is the same at the living descendent’s, i.e., it’s a fraud. …unless the article lied and it wasn’t a 100% perfect match. If so, falsus in uno, falsus in omnibus.